Yikes, it's hot outside! No matter where you live this time of year, you're feeling it. Whether you're in the dry heat of the Southwest, where it's sizzling, or the muggy heat almost everywhere else, you're sweating. Heck, your dogs and cats feel it. They're panting right now. But did you know your electronics feel the heat, too? Well, maybe they don't feel the heat, but they're adversely affected by it. All those circuits working inside your smartphone, for example, heat up. When you have it plugged in to charge, it's heating up. Then, add hot temperatures to that, and it gets too hot. The hotter it gets, the more it uses battery power. Your smartphone may start acting unusual as the heat inches up. The most likely impact will be a fast-dying battery. You may get other warning signs, too. That could include an actual warning on your iPhone, for instance, that alerts you with a red thermometer. 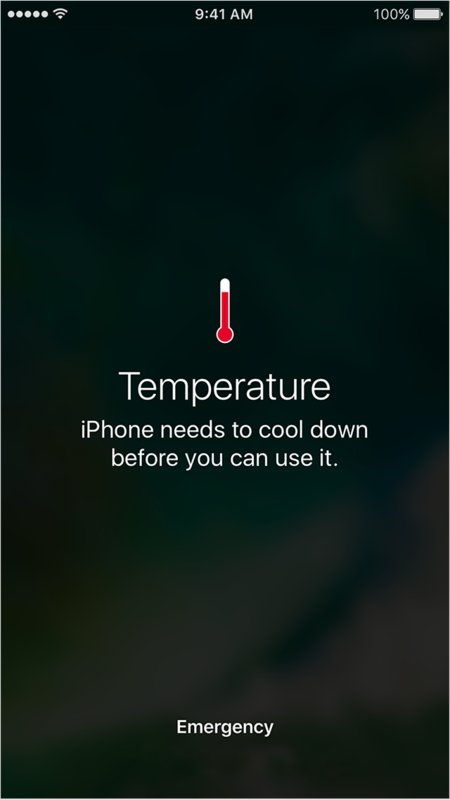 It says your iPhone needs to cool down. Apple suggests using your iPhone in temperatures up to 95 degrees. You can store it at temperatures not exceeding 113 degrees. "Don’t leave the device in your car because temperatures in parked cars can exceed this range," Apple warns on its support website. Whether you're using an iPhone or an Android smartphone, you want to avoid hot temperatures. That means, don't leave it in direct sunlight and avoid using GPS and other energy-draining functions.